Get Me to the Starting Line VIP - Access to the starting line VIP area. MegaFan/I Want it All VIP - Best seats VIP, starting line VIP access, staging lane access, plus early entry into venue and cast pits. 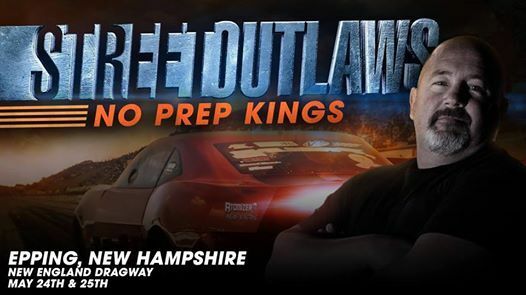 Street Outlaws Cast in Their Daily Drivers - Only Street Outlaws Cast - You've seen the Street Outlaws race their daily driven cars on the TV show, now watch them race LIVE! Future Street Outlaws Drivers Race - First Round - $5000 Guaranteed, $500 Buy in (Big Tire Event) - This is where we find the future Street Outlaws Racers. Anyone can come out and race in this event. Street Outlaws Cast Grudge Racing - Big Tire grudge racing in preparation for the invitational. Future Street Outlaws Drivers Race - Continued to completion from Friday - $5000 Guaranteed, $500 Buy in (Big Tire Event) - This is where we find the future Street Outlaws Racers. Anyone can come out and race in this event. Small Tire Brawl Main Event For the Points Championship Race - $250 buy in, $5000 guaranteed - Race to $20K - The top 16 in points (who have completed at least 6 races) are invited to race for free at the final NPK event for an additional $20K and the small tire points championship. Street Outlaws Invitational - This is the MAIN EVENT! Outlaw Big Tire - $5000 guaranteed, $250 buy in. 965 the Mill's April boomer bash! Good Deeds Day - Teens of NH!